This post has been sitting in my drafts for a while, which is a shame as this product doesn't deserve to sit in the corner, in all honesty like all No.G products, it's phenomenal! 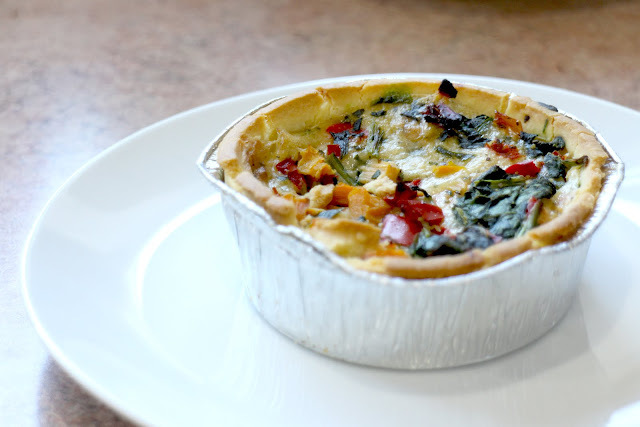 Perfect for lunch, dinner or a picnic, this open top pie is more or less a very deep quiche. I feel the pastry is slightly different to the No.G quiches as it seemed more crisp and thinner, but it may have just been the way I cooked it! Filled with plenty of ingredients, this highly flavoured pie retails averagely for £2.50 in Morrisons, Sainsbury's, Ocado and now Waitrose! At 405 calories per pie, these are a very filling meal either on their own or with a side salad. As expected there is 26.3g of fat per pie, but if you are choosing to eat pastry, you will be aware of this and know what to expect anyway! Perfect for a midweek dinner as you can just throw it in the oven, there is very little effort involved. But being packed with butternut squash, red pepper, extra mature cheese and spinach, it is so flavoursome and all the hard work has been done for you! Something I know would take me a good couple of hours to prepare from scratch and wouldn't taste half as good! The balance is perfect and makes the product taste fresh, healthy and slightly more nutritious but has a creamy decadence creeping in too. Making it a perfect treat without feeling like the second ingredient on the packet should be regret, haha! Like all No.G products, the pastry is perfect. This is the pastry I now use as my benchmark to judge others, as all the pastry I have sampled from No.G has been exceptional. Golden, crisp and perfectly crumbly/flakey makes their pastry in my opinion the very best in the free from market. Not once have I had issues with them going soggy, feeling stale even though well within date or having a horrendous after taste. I feel that although No.G is on the higher price point of the market it has never let me down and this justifies the price. Unfortunately this product does contain milk and egg, so is only suitable for gluten free diets, this is very obvious without reading the ingredients due to the inside resembling the fluffiness of an omelet, which can only be achieved using dairy. Synthetic or natural replacers for dairy products are not quite the same and don't achieve the same effect, or at least when I have tried, but I am always open to advice! Another amazing product from No.G in my eyes and I can't wait to get my hands on some more bits to try! Making itself provides the delicious food or the chats within your talents. Thanks for the sharing.